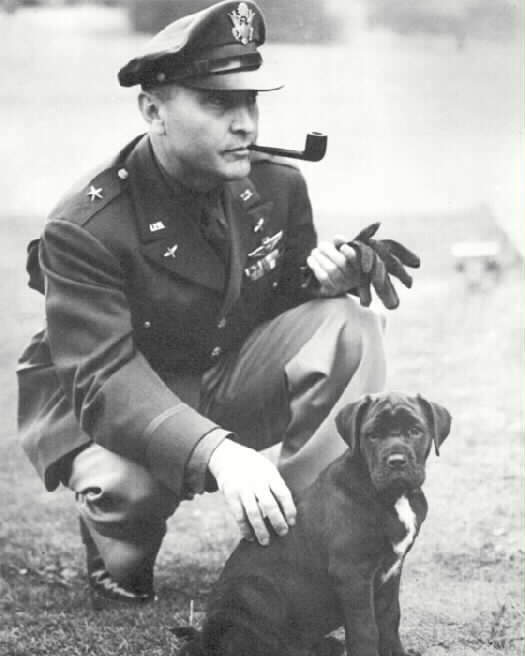 Commanded U.S. Air Forces in Europe in WWII, helped establish USAF as separate service. He died at Malcolm Grow Medical Center, Andrews Air Force Base, Camp Springs, Maryland. He was 91 years old and lived in Washington, DC. The cause of death was not announced pending an autopsy that was described as routine, but a spokesman at medical center said yesterday that he had been ill for some time with heart ailment. He had retired from the United States Air Force as a Lieutenant General in 1947 and until late 1970s was a business executive and syndicated newspaper columnist. In 1985 President Reagan, with the approval of Congress, bestowed on him 4th star of full General in recognition of services to the nation. "Few men can equal his great stature as an air pioneer - we owe him our gratitude for his contributions to the Air Force and the nation," Air Force Chief-of-Staff, General Larry Welch, said in a statement at Pentagon. The son of a Texas tenant farmer, he earned his wings in 1918 and became one of nation's aviation pioneers, setting a world record in 1929 by staying aloft for nearly a week by refueling in air. He later made the first "blind" transcontinental flight entirely with instruments. With Generals William (Billy) Mitchell, James H. Doolittle, H.H. (Hap) Arnold and other major aviation figures between the two world wars, was a leader of the fight to establish air power as key element in nation's strategic arsenal. During 1919-22, while stationed in Philippines, continued his studies at the University of the Philippines, advancing to Captain in July 1920, and in 1922, while at Michel Field, New York, he took law courses at Columbia University. From 1924 to 1926 was in office of chief of Air Service. But it was as Commander of air forces in the European Theater in WWII that he made his name. He commanded the famed 8th Air Force in Britain in 1942 and 1943, commanded allied air forces in Mediterranean in 1944 and 1945. In the final months of war, he was named Deputy Commander of Army Fir Forces and chief of the air staff in Washington, DC. In his Flying Fortress, the Yankee Doodle, Eaker, a husky, square-jawed cigar-smoking pilot with a Texas drawl, flew many missions over Europe and into Germany, and personally led first US B-17 bomber strike against German occupation forces in France, bombing of Rouen, Aug 17, 1942. In Jun 1944, after being trans to Mediterranean, he flew the first bombing raid from Italy into Germany, landing in Soviet Union after striking factory and oil installations and other military targets. He was a key proponent of the precision daylight bombing that attacked much of Germany's industrial war production. Fearing heavy losses, Allied leaders were skeptical of the tactic. He took his case directly to Winston Churchill and obtained permission to hit key targets by day. At the Casablanca conference of allied leaders in early 1943, daylight precision bombing became a basic element of Allied strategy, and much of the credit was given to him. In service in Britain, he also developed plan by which enemy targets were bombed virtually around clock, with US B-17s striking by day and RAF bombers attacking by night. Born at Field Creek, Texas, Apri1 l3, 1896, he graduated from Southeastern Normal School, Durant, Oklahoma, and entered the Army in 1917. Though an enlisted man, was soon admitted to officers training program and by year's end was commissioned a Second Lieutenant of Infantry. He did not leave the US during WWI, but transferred to what then was nation's air force, the Aviation Section of Army Signal Corps, and, after training at Austin and Kelly Field, Texas, received his pilot's wings in October 1918. In 1926, a Captain, he was second-in-command of 2,000-mile Pan American goodwill tour by Army planes that circled Central and South America. Three years later, he piloted Army's "Question Mark," establishing world endurance record by remaining aloft more than 150 hours in a series of pioneering airborne refueling operations. A year later, made the first trans-continental flight using the same refueling techniques and several years afterward crossed the continent in an all-instrument flight on which he did not look out of cockpit. Amid these and other exploits, recd a series of promotions and named a 2-star gen just as WWII began. Though he retired June 15, 1947, a month before the United States air Force officially became separate branch of military service, he helped plan that change and was credited by colleagues with being instrumental in achieving it. He received the Silver Star, Distingusihed Flying Cross and other US military honors, including a special Gold Medal from Congress in 1979, and was decorated by Britain, France, Soviet Union, Yugoslavia, Italy, Poland, Brazil, Chile and Peru. After ret, was officer of Hughes Tool Co and Hughes Aircraft Co until 1957. He was then a Vice President of Douglas Aircraft Company for many years. For 18 years in the 1960s and 1970s, wrote column on military affairs that was syndicated to 180 newspapers. With General Arnold, he was teh co-author of 3 books, "The Flying Game," published 1936, "Winged Warfare," in 1937, and "Army Fever," in 1942. 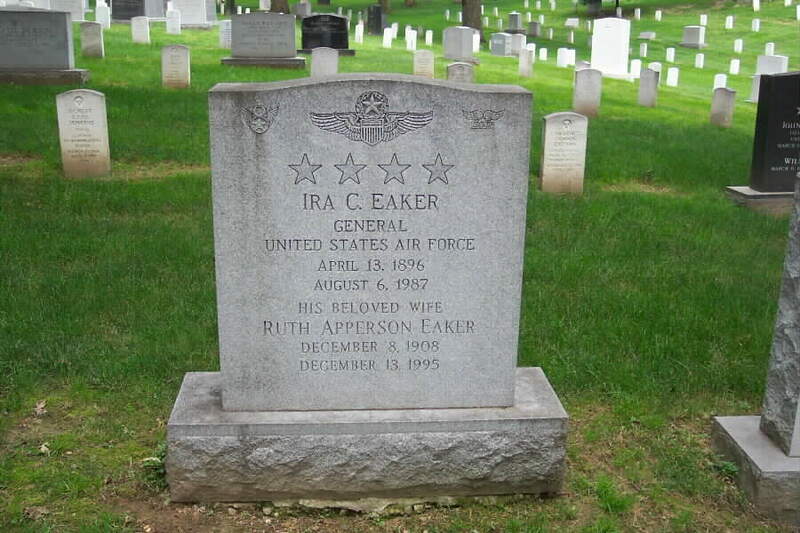 A book about him, "Air Force Spoken Here: General Ira Eaker and the Command of the Air," by James Parton, appeared earlier this year. He was survived by wife, the former Ruth Huff Apperson. The funeral is scheduled for Ft Myer, Virginia. One of the founding pioneers of modern concepts of strategic air power, inducted into Aviation Hall of Fame, Dayton, OH, in 1970. Apr 13, 1896-Aug 6, 1987. He is buried in Section 30 of Arlington National Cemetery. Beside him lies his wife, Ruth Apperton Eaker. 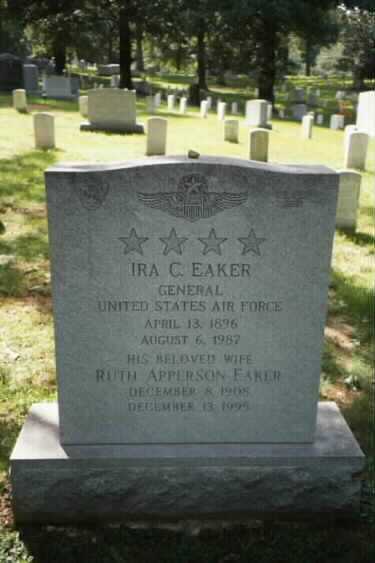 Ira C. Eaker was born in Field Creek, Texas, in 1896. He was appointed a second lieutenant in the Infantry Section, Officer's, Reserve Corps, and assigned to active duty with the 64th Infantry at El Paso, Texas. On Nov. 15, 1917, he was commissioned a second lieutenant of Infantry in the Regular Army. General Eaker remained with the 64th Infantry at El Paso until March 1918, when he was placed on detached service to receive flying instruction at Austin and Kelly fields in Texas. Upon graduation the following October, he was rated a pilot and assigned to Rockwell Field, California. In July 1919, he transferred to the Philippine Islands, where he served with the Second Aero Squadron at Fort Mills until September l919; with the Third Aero Squadron at Camp Stotsenburg until September 1920, and as executive officer of the Department Air Office, Department and Assistant Department Air Officer, Philippine Department, and in command of the Philippine Air Depot at Manila until September 1921. Meanwhile, on July 1, 1920, he transferred from the Infantry to the Air Service and returned to the United States in January 1922, for duty at Mitchel Field, N.Y., where he commanded the Fifth Aero Squadron and later was post adjutant. In June 1924, the general was named executive assistant in the Office of Air Service at Washington, D.C., and from December 1926, to May 1927, he served as a pilot of one of the planes of the Pan American Flight which made a goodwill trip around South America. He then became executive officer in the Office of the Assistant Secretary of War at Washington, D.C. In September 1926, he was named operations and line maintenance officer at Bolling Field, Washington, D.C. While on that duty, he participated as chief pilot on the refueling endurance flight of the Army plane, "Question Mark", from Jan. 1 to 7, 1929, establishing a new world flight endurance record. In 1930, he made the first transcontinental flight with in-flight refueling. In October 1934, General Eaker was ordered to duty at March Field, Calif., where he commanded the 34th Pursuit Squadron and later the 17th Pursuit Squadron. In the summer of 1935, he was detached for duty with the Navy and participated aboard the aircraft carrier, "Lexington", on maneuvers in Hawaii and Guam. General Eaker entered the Air Corps Tactical School at Maxwell Field, Alabama, in August 1935, and upon graduation the following June entered the Command and General Staff School at Fort Leavenworth, Kan., from which he graduated in June 1937. 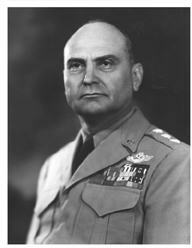 He then became assistant chief of the Information Division in the Office of the Chief of Air Corps at Washington, D.C., and in November 1940, assumed command of the 20th Pursuit Group at Hamilton Field, California. In January 1942, he was assigned to organize the VIII Bomber Command and to understudy the British system of bomber operations; then in December 1942, he assumed command of the Eighth Air Force in England. 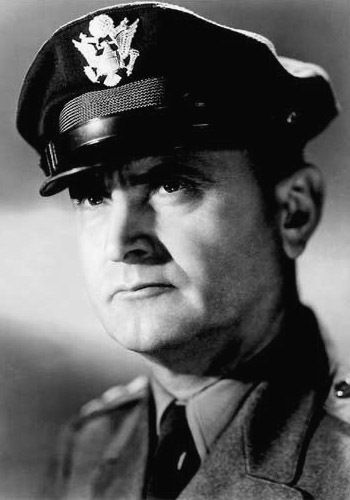 Later, he became commanding general of all U.S. Army Air Forces in the United Kingdom. In January 1944, he was named air commander-in-chief of the Mediterranean Allied Air Forces, having under his command the 12th and 15th U.S. Air Forces and the British Desert and Balkan Air Forces. 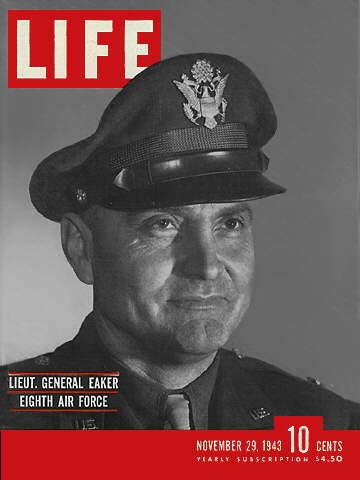 On April 30, 1945, General Eaker was named deputy commander of the Army Air Forces and chief of the Air Staff. 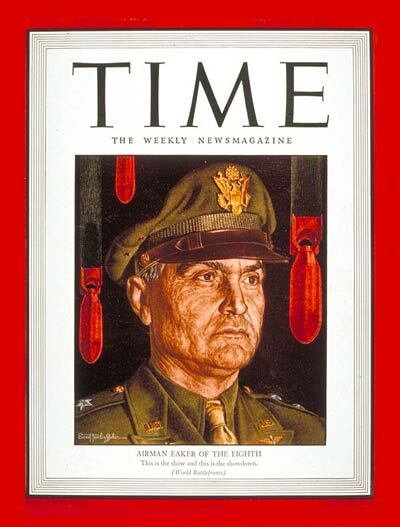 He retired August 31, 1947, and was promoted to lieutenant general on the retired list June 29, 1948. General Eaker is a pilot with 12,000 flying hours in 30 years of flying. His military decorations include the Air Force Distinguished Service Medal; Army Distinguished Service Medal with two oak leaf clusters; Navy Distinguished Service Medal; Silver Star; Legion of Merit; Distinguished Flying Cross with oak leaf cluster; Air Medal; World War I and II Victory Medals; American Defense Service Medal; American Campaign Medal; and the European-African-Middle East Campaign Medal with bronze service stars. General Eaker's foreign decorations include the Bolivian Order of Condor of the Andes; the Chilean Order Al Merito, Officer; Peruvian Order of the Sun of Peru, Officer; Venezuelan Order of the Liberator, Officer; Knight of the British Empire; Brazilian Order of the Southern Cross, Grand Official Order; Russian Order of Kutusov, Second Degree; Yugoslavian Partisan Star, First Class; French Legion of Honor, Grand Officer; French Croix de Guerre with Palm; Italian Grand Master of the Order of Saints Maurice and Lazarus; British Knight Commander of the Bath; Brazilian Order of Aeronautical Merit; Polish Military Order of the Gold Cross of Merit with Swords. General Eaker is co-author of "This Flying Game," "Army Flyer," and "Winged Warfare." Since 1962 he has authored a weekly column, carried by more than 35 newspapers, on subjects in the national security area. On Oct. 10, 1978, the president of the United States, authorized by act of Congress, awarded in the name of the congress, a special Congressional Gold Medal to General Eaker, for contributing immeasurably to the development of aviation and to the security of his country.